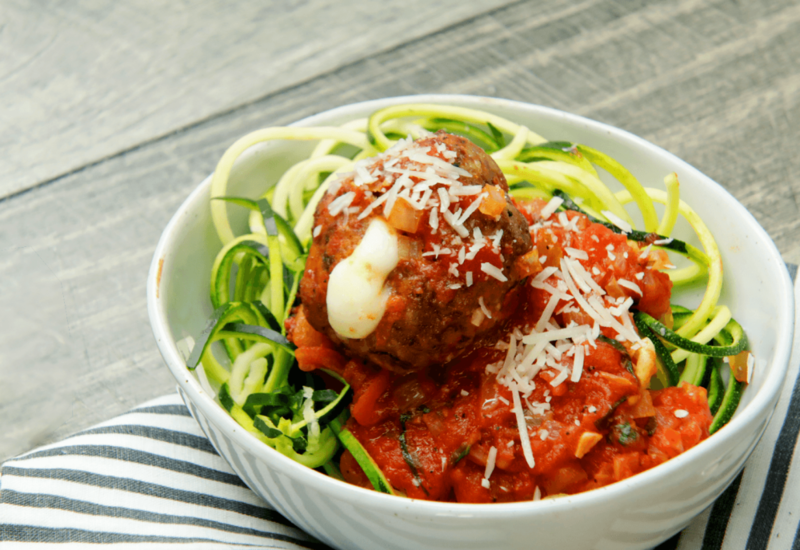 You'll never want to eat normal meatballs again after stuffing them with fresh mozzarella balls! Use summer squash instead if you have it on hand! Per Serving: 582 calories; 39g fat; 14.2g carbohydrates; 43g protein; 179mg cholesterol; 992mg sodium. These were awesome. If you don't have a meatball recipe that you love. Adopt this one. If you do have a meatball recipe that you love, adopt this one. Just a perfect meatball recipe. These mozzarella stuffed meatballs are delicious. The beef and pork together was a great choice, everything is seasoned well, and made to perfection. Definitely my new go-to meatball recipe. Melty mozzarella stuffed in a flavorful meatball! I am drooling all over this recipe. I made the meatballs as a party appetizer and skipped the zucchini noodles. The marinara sauce was perfect for dipping. I can't wait to make these again! I made this but with regular spaghetti, and it was amazing! The stuffed meatballs were really easy to make. Also, I didn't have any whole milk so I used 2% with no problems. I tried to make stuffed meatballs before with mozzarella string cheese and it didn't work. This version using ciliegine mozzarella worked great. The cheese was so creamy and rich. The only thing I changed with this recipe was using beef only, no pork. So yummy.